Today on CNN’s State of the Union with Candy Crowley, Dr. Hanan Ashrawi, PLO Executive Committee member, responded to Israeli Prime Minister, Benjamin Netanyahu’s interview on CNN’s State of the Union earlier this morning. She said Israel is violating international law and finding any excuse to stop the peace process. CANDY CROWLEY, HOST: Now I want to bring in Hanan Ashrawi. She is a top legislator in the Palestinian government. Thank you for joining us this morning. CROWLEY: That Netanyahu has said I am not going to negotiate with a government that is backed by Hamas. That can’t be a surprise. ASHRAWI: No, it is a surprise, frankly speaking. But I expected him to find any pretext, any excuse, to scuttle the talks, which is something he’s been doing from the beginning. He has escalated settlement activities, the land theft, the siege of Jerusalem, the siege of Gaza. He has reneged on his agreements and obligations. I mean, he’s even escalated violence, he’s tried everything to destroy the talks and now he’s clutching at the pretext that the Palestinians are trying to reach unity, and that’s something he doesn’t like, because he wants to pick and choose his counterparts. By that same logic I can say I don’t want to talk to the Likud, Netanyahu, or Naftali Bennett, or Lieberman. I would much rather talk with people who don’t want to take all of Palestine, who are not busy launching attacks on Gaza or the West Bank, who are not killing Palestinians daily, I want to talk to Zahava Gal-On of Meretz. This is not how you make peace. Even when President Abbas reached out and tried to show human commiseration and sympathy, he very cynically, you know, slapped him down. This is ridiculous. If Netanyahu is serious, he can abide by international law and the requirements of peace. CROWLEY: Now he also said in that interview, as you heard, that if Hamas would recognize Israel and renounce terrorism and renounce violence, that he would come back to the table. Do you think Hamas will do that? 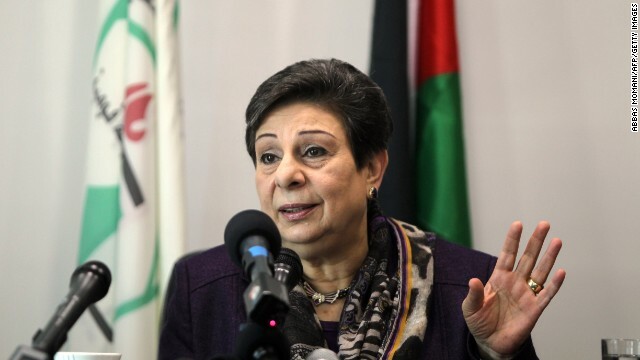 ASHRAWI: Well, Hamas is not negotiating. What we’re setting up is a government of independent professionals to deliver services, to build institutions and to oversee elections full stop. The PLO is the body that represents the Palestinians and that negotiates on their behalf and that is empowered to sign agreements on their behalf. So, the political address is not this government, but it is the PLO that remains the one body empowered to do that. In that sense, nobody’s asking him to talk to Hamas or even to the government. And we know that the government is set up of independents. I think this is really a very specious argument. And he’s trying to find ways out. And demonizing the Palestinians and pulling out constantly terrorism and denial of the Holocaust and so on as the reasons why he doesn’t want to talk to the Palestinians, this is really quite misleading. We want serious, substantive negotiations and that’s what is called upon. And John Kerry has really tried, has exerted enormous efforts. Nobody doubts his sincerity, dedication, tenacity trying very hard to have talks. ASHRAWI: Unfortunately he didn’t get much cooperation. CROWLEY: And I want to ask you about the U.S. role in a minute. But first I want to read you something from a spokesman for Hamas which came, I believe, after President Abbas put out the statement saying, this will be our government, it still recognizes the progress that’s been made with Israel, recognizes Israel and wants a peaceful negotiations. ASHRAWI: It doesn’t have to. CROWLEY: I’m sorry, go ahead. ASHRAWI: I said it doesn’t have to because you don’t go to individual parties and factions and ask them to recognize countries, only countries recognize countries. The president represents Palestine. We recognized Israel in 1993. And with signed agreements between Yasser Arafat and Yitzhak Rabin, and that’s it. And the PLO and the president are doing the negotiations and they represent the country of Palestine. If we, again, by the same token go back and ask every single Israeli party to accept our rights and to accept the two-state solution, we will find a very, very slim minority to talk to. We do not negotiate with parties. You do not ask for recognitions from — this is — this is all — these are all very flimsy excuses. I think it’s time we deal with substance and with behavior. CROWLEY: Let me ask you about the U.S. reaction. We had a national security adviser to the president here this morning, and he hinted at two things. First of all, that this unity government has been tried before and might not happen after all and the U.S. is taking a wait and see, but also said that the U.S. certainly would reconsider aid to the Abbas government if indeed this union takes place. Your reaction to both of those? ASHRAWI: Well, that is extremely unfortunate, again. I mean, congress is very busy trying to prove that they can be more loyal to Israel than to the U.S., unfortunately. They even give us power over the U.S. by saying they will leave any agency that we join and the UN agency that we join, which means that they gave us power to isolate the U.S. But anyway, I think that the issue is not Hamas. Again, the Americans know that the administration knows that. The issue is whether we have a political address (ph) capable of representing all Palestinians. Either you want to make peace with part of the Palestinians in the West Bank, a few people that you choose or in the West Bank, and Jerusalem including Jerusalem and Gaza. And the 5.5 million Palestinians in exile, we need to make peace with everybody. But if you insist on a partial peace with part of the people that you like, then it means that you’re not going to get anywhere. And this a peace that will not stand. CROWLEY: Hanan Ashrawi, as always, we appreciate you coming on. Hope to see you again, thanks.